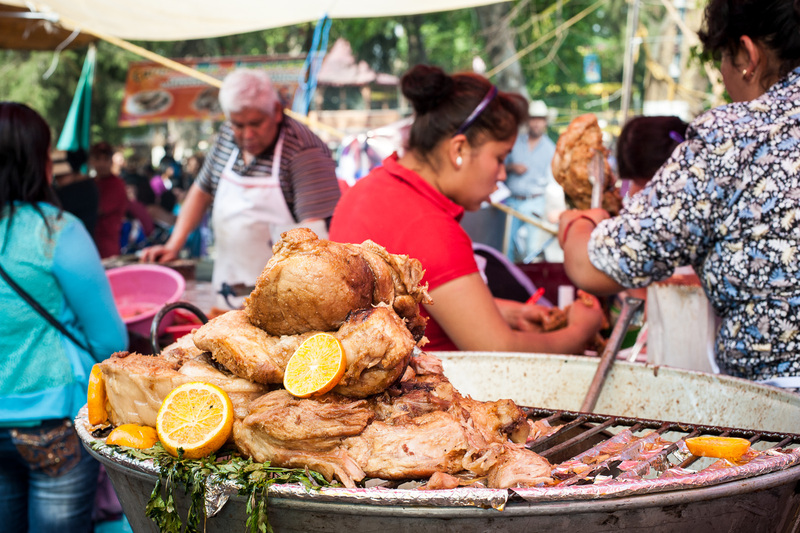 Thanks to advice from Puebla's Tourist Information Office, we caught a bus to Huejotzingo (10 pesos each for a 45-minute trip) to experience Carnival Mexican style. 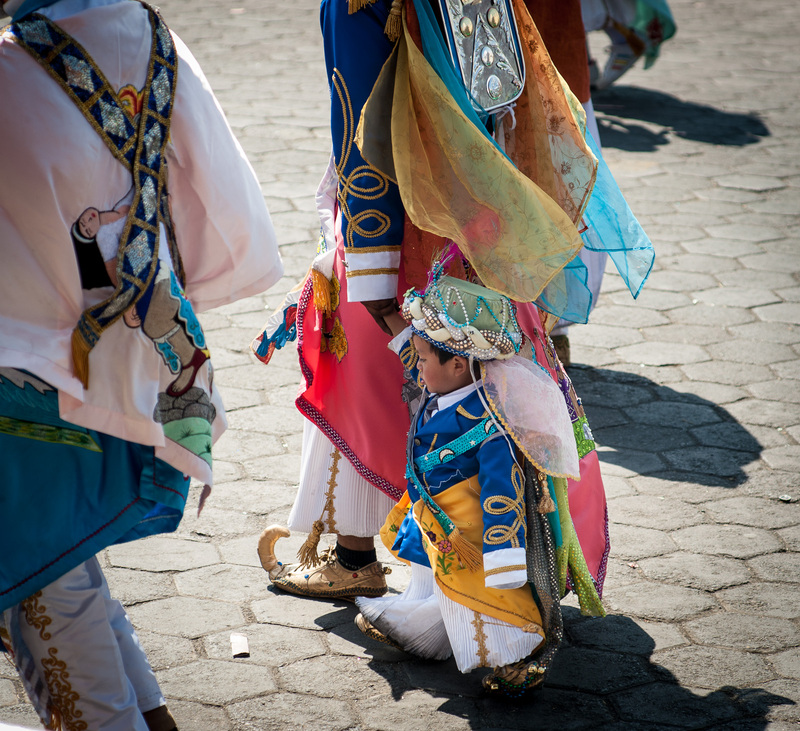 This carnival, the oldest in the country, has been going since 1868. 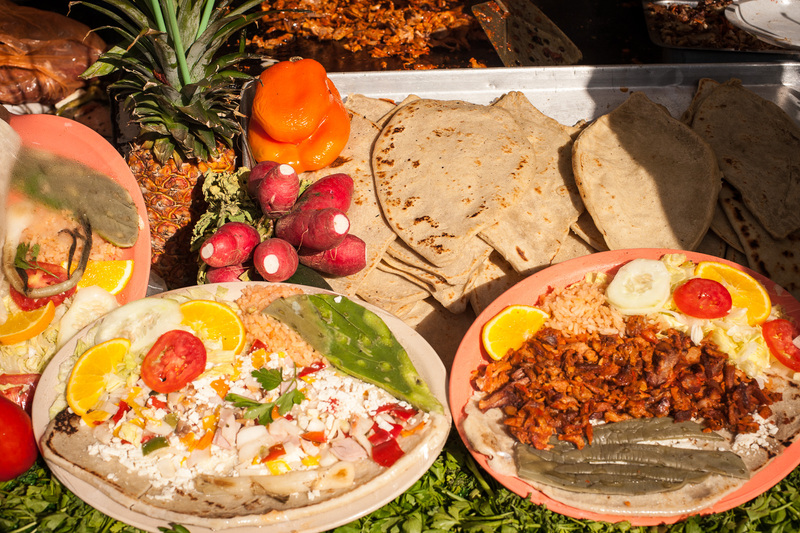 The day commemorates the May 5, 1862 win at the Battle of Puebla. The Mexicans won this battle with an army 1/3 the size of the French army. 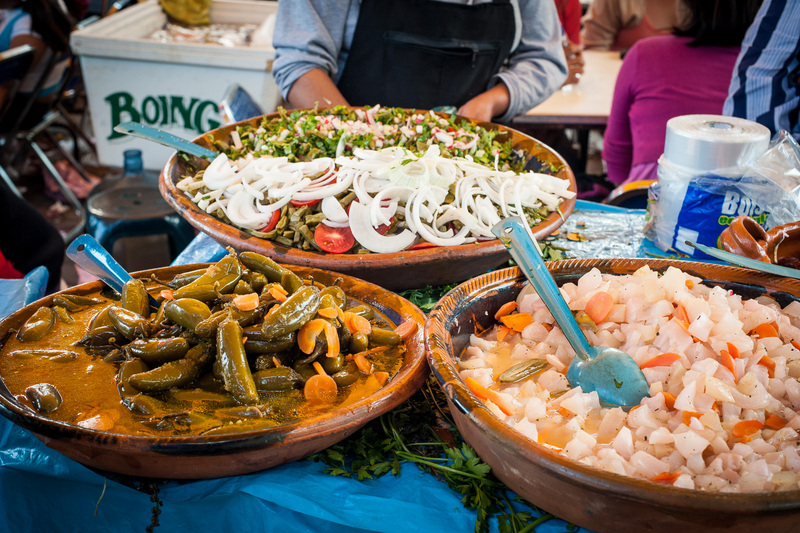 This stunning win is the source of the Cinco de Mayo celebration in Puebla and in the US. Although the French won the war in 1863, the victory of the 1862 battle is celebrated still. 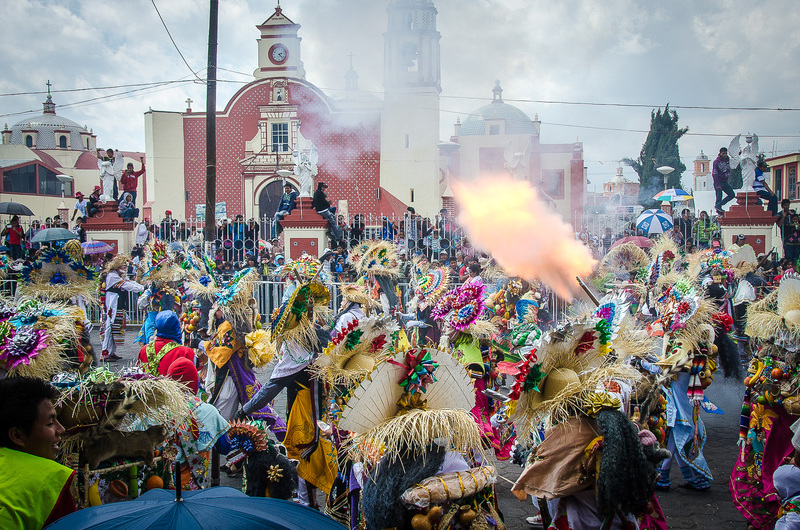 Before attending, we read a little about the history of the event that is spread over four days culminating in a reenactment of the Battle of Puebla and a parade. We knew there would be heavy use of gunpowder and muskets and that there were always injuries. 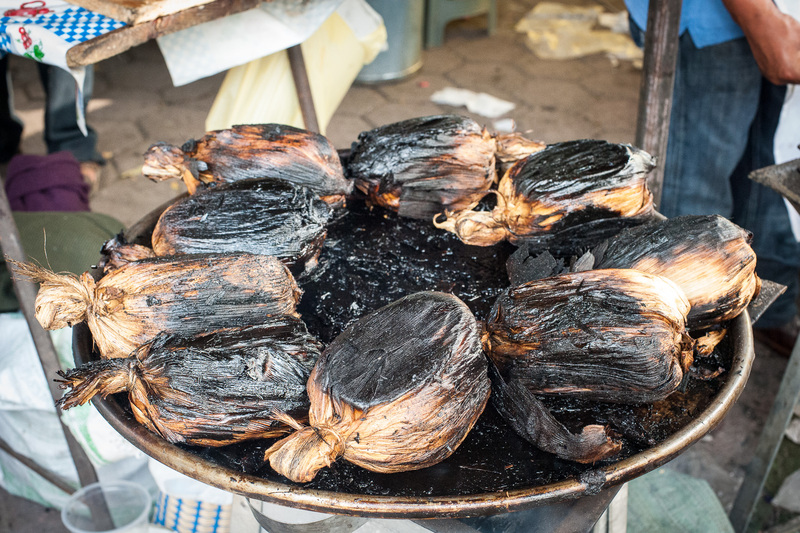 In 2013 over 100 people were injured mostly from gunpowder burns. We went anyway. We arrived unfashionably early, paid the entrance fee (35 pesos each) to the viewing stand, and settled into a front row bleacher seat with an unobstructed view. As time went on more people arrived filling the stands and consuming the standing/sitting spaces in front of us. While we were waiting, vendors worked the crowd squeezing up and down the bleachers to get to customers. Several vendors were selling earplugs and face masks. Hearing the muskets shots around town, the earplug purchase seemed like a wise move. I bought a pair of earplugs; Dan did not. 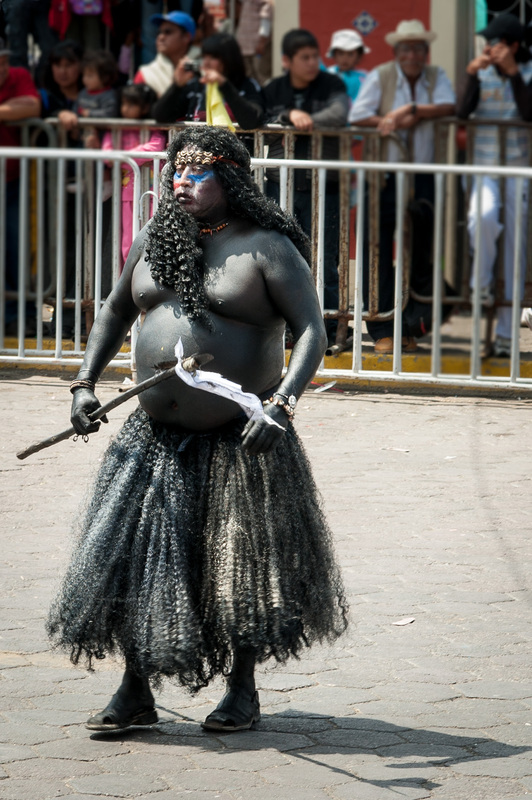 About two hours later, the parade began with music and a throbbing mass of people in costume throwing candy to the spectators. About 12,000 people participate in this parade. 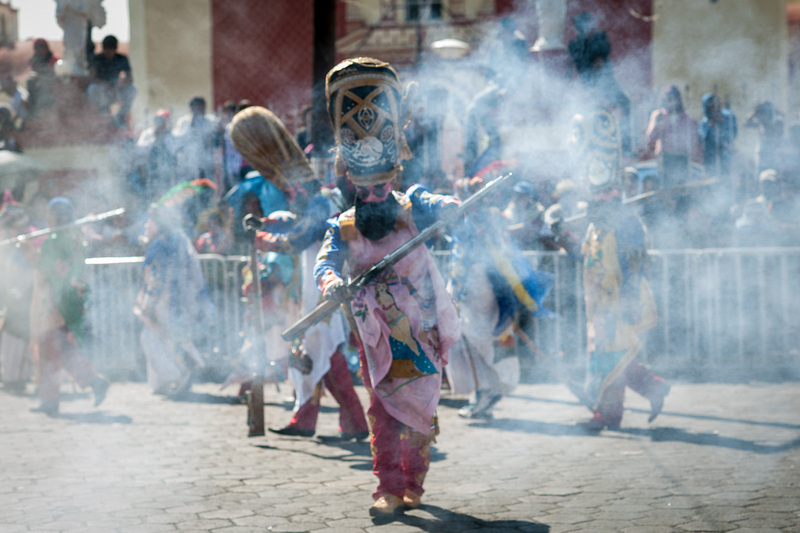 The parade included seventeen battalions representing the two sides in the Battle of Puebla. The Battle participants are separated by marching bands. The French imperial army, the losers in this battle, consists of the Zuavos, Turcos and Zapadores. 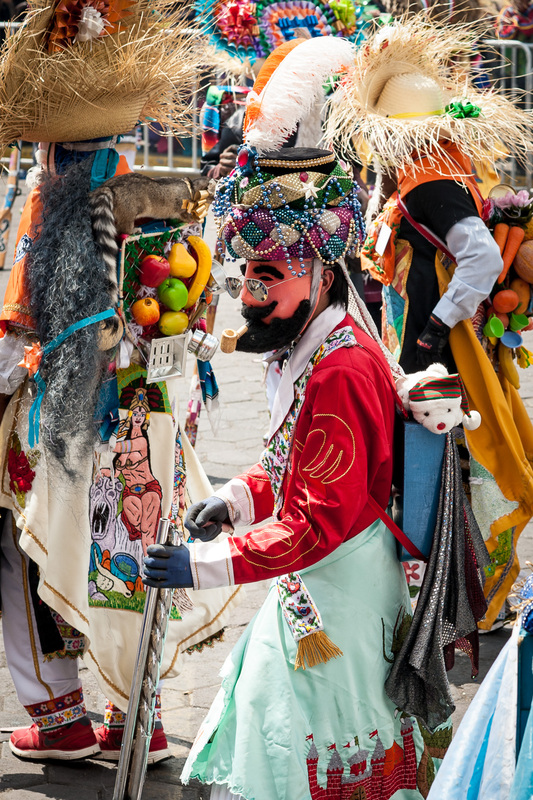 Also represented in this carnival were the Mexicans of African descent who historically fought on the side of the French. The “Franceses” (French) or “Zuavos” represent a group of elite French troops at the Battle of Puebla, noted for their cruelty. 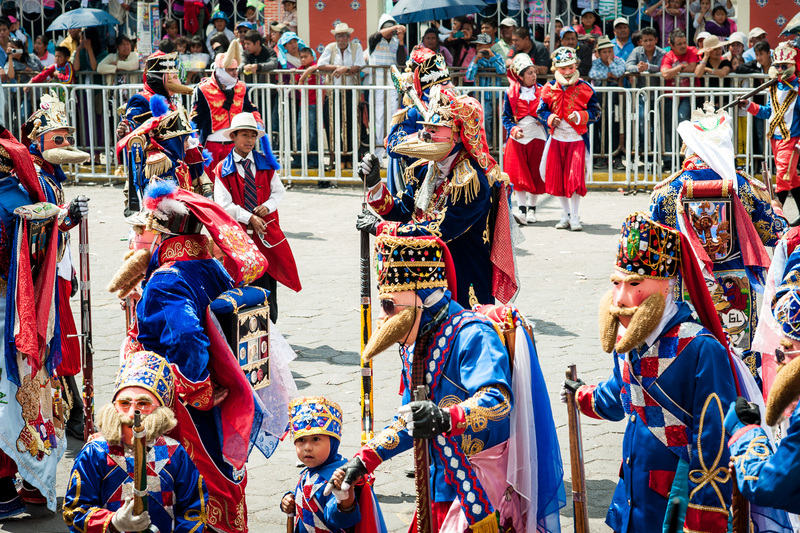 They wear a blue cap decorated with stones, gold ribbons, sequined belts, leather masks, dark glasses and royal blue capes. They carry wooden boxes on their backs underneath which are the flags of France and Mexico. In the box there are soldiers’ provisions such as French bread (Wikipedia). You might wonder what the Turks have to do with the Mexican-French Battle of Puebla--nothing really, but every plot needs a villain. The “Turcos” (Turks) are in reference to the Muslims against which the evangelists preached heavily in the early colonial period, although the Muslims in Spain were Moors rather than Turks. 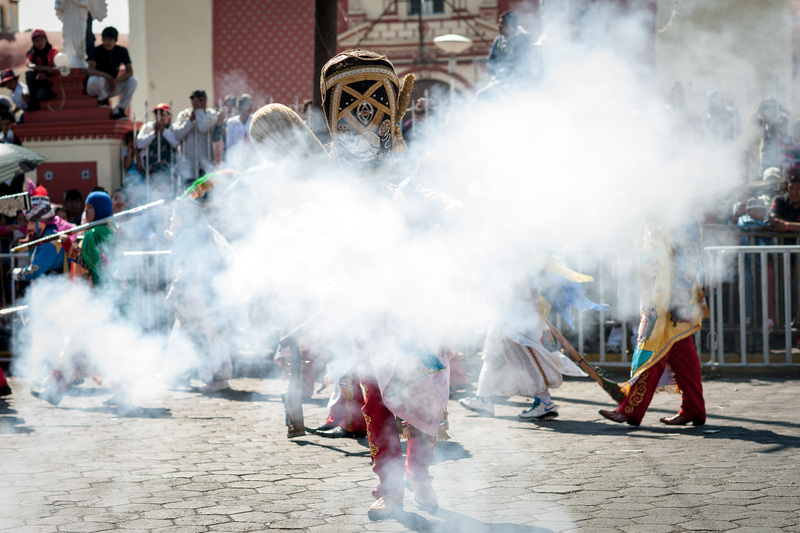 They are still considered an “enemy” to Mexico in popular imagination and are in this carnival. They are also considered to represent mercenaries from Egypt brought by Napoleon III . They are dressed with turbans or tall hats, silk clothing, and scimitars and with crescent moons and peacock feathers used as decorative elements. They also have silk capes embroidered with images of Mexican heroes. The Turkish battalions mostly consist of people who live in the four original neighborhoods of Huejotzingo (Wikipedia). The Turkos costume included athletic shoes with augmented, customized curled toes. 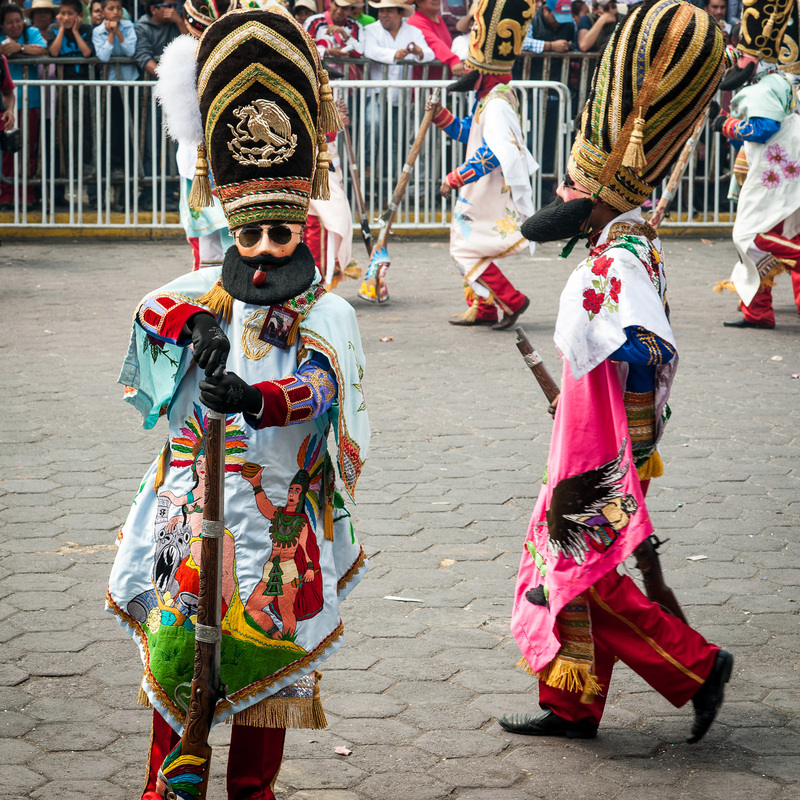 The “Zapadores” are those who represent those of the elite classes in Mexican society. They are dressed as the imperial guard of Maximilian I and some as the personal guard of Mexico’s first emperor Agustín de Iturbide. Their outfits mix the national colors of both Mexico and France. 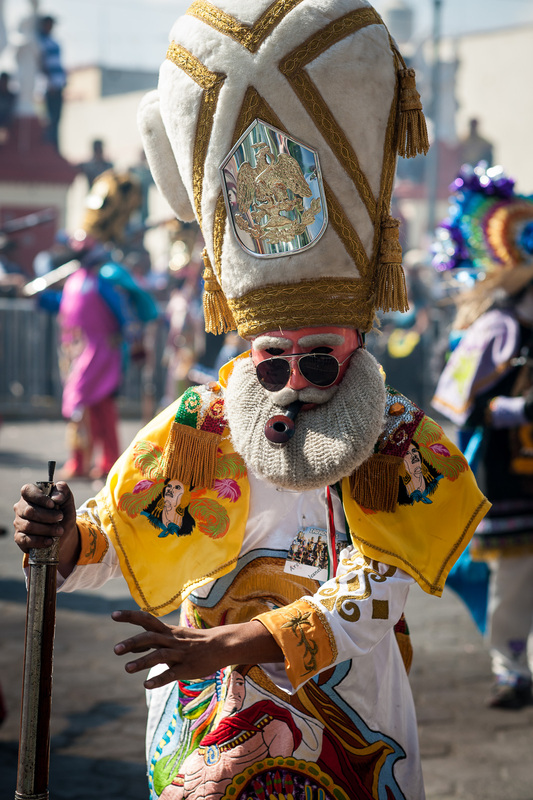 They wear Spanish colonial style helmets made of black leather with the crest of Agustín de Iturbide, in remembrance of Mexico’s independence. For similar reasons, they also wear ribbons of green, white and red of Mexico’s current flag (Wikipedia). 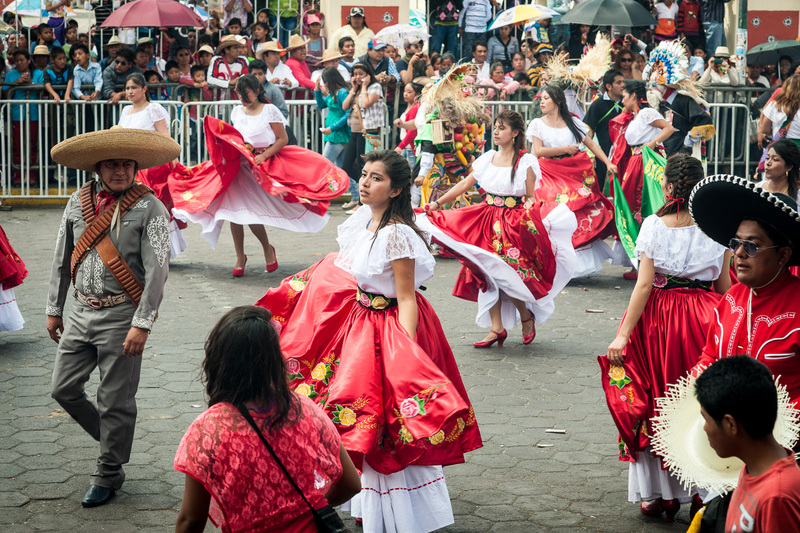 And, two groups paraded to represent the Mexicans of African Descent. One group had a large stuffed black panther that one person would toss into the air while the others threw spears at it. It was one of the funnier moments in this parade. And on the winning side, the Mexican army is mostly represented by the Indios Serranos and the Zacapoaxtlas, but "Apaches" dressed as Aztecs also fought with the Mexican Army. 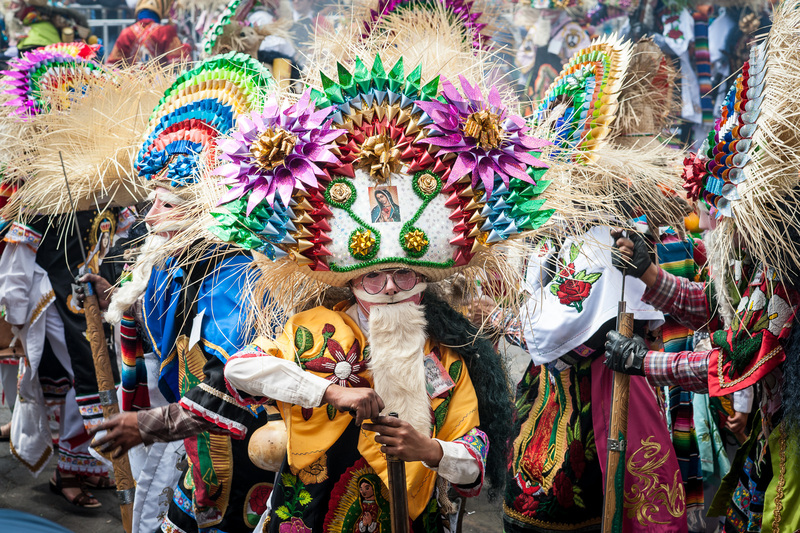 They represent Huejotzingo’s indigenous past but their costumes are a fusion of both indigenous and European influences. 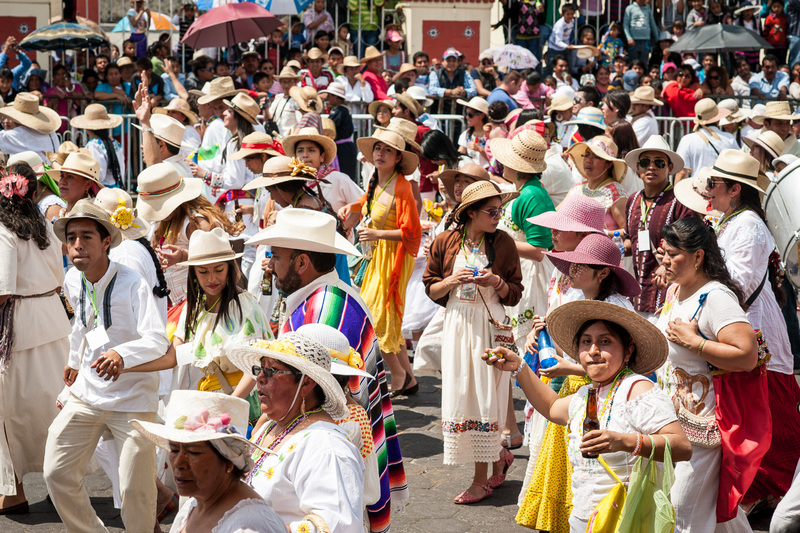 Their hats are traditionally made from palm fronds (although many now are made with a kind of plastic strip) which have the image of the Virgin of Guadalupe, the patroness of Mexico. 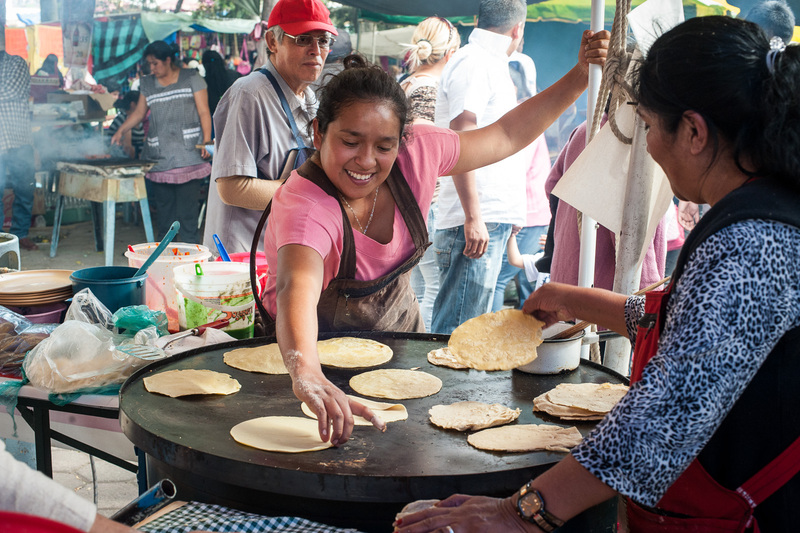 They also carry an animal skin, preferably that of a cacomixtle in honor of the indigenous goddess Camaxtli, who was the patron of the region (Wikipedia). 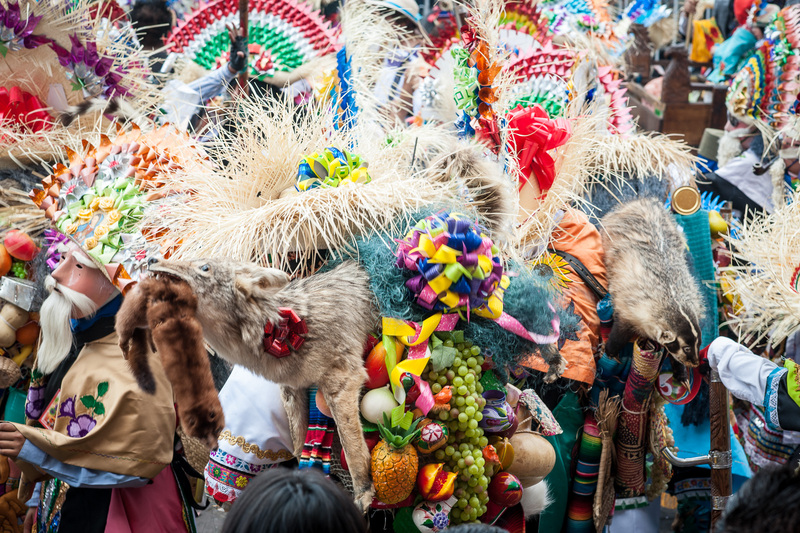 The animal skin custom has morphed into carrying formerly living stuffed animals (even a domestic cat) on the backs of the Indios Serranos. 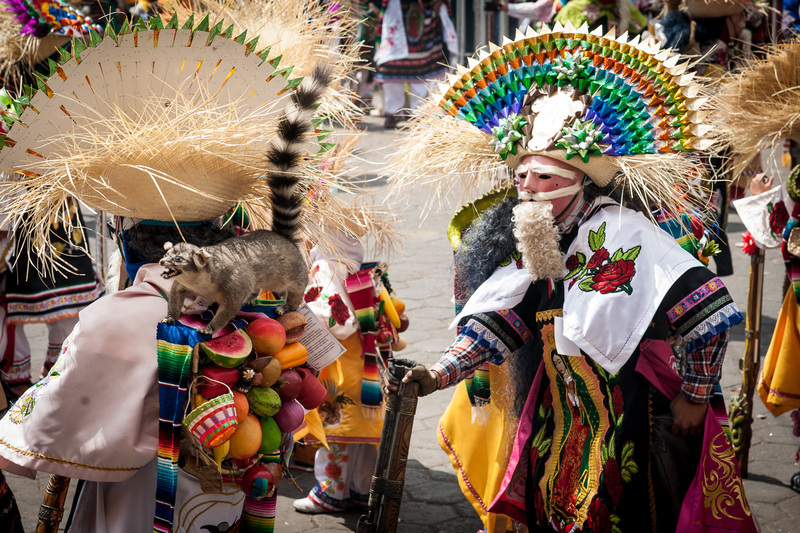 The Nahuatl word, cacomixtle, means "half cat". It has a brownish body with a black and white ringed tail. The ring-tailed animal below might not be a cacomixtle but rather a ring-tailed cat of the raccoon family. 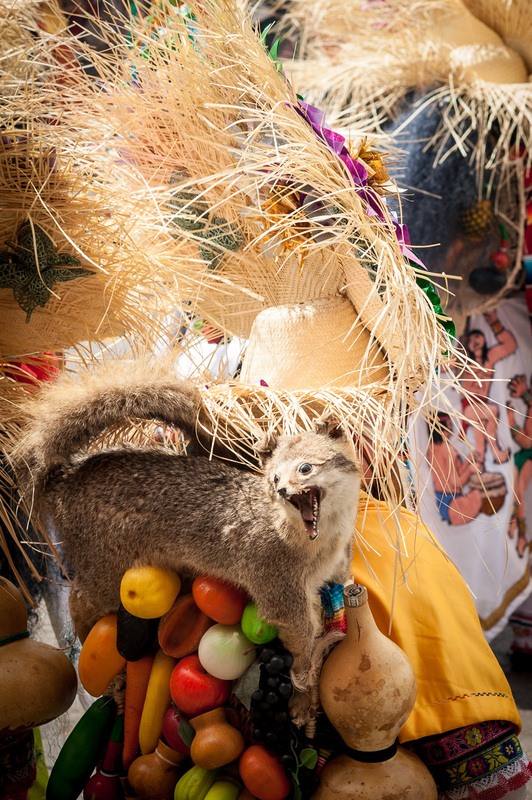 Happily, both the cacomixtle and ring-tailed cat are not endangered species. 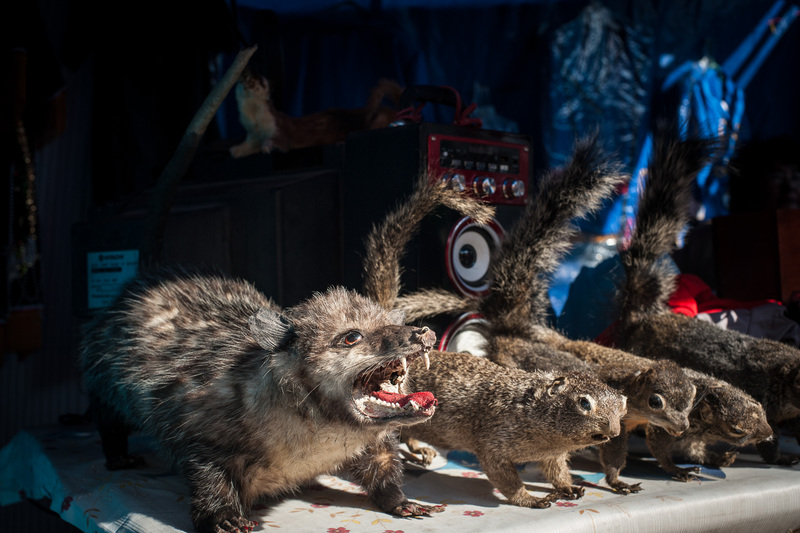 One of the vendors outside of the viewing stand, had a table of formerly living stuffed animals for sale. Maybe these are cacomixtles. 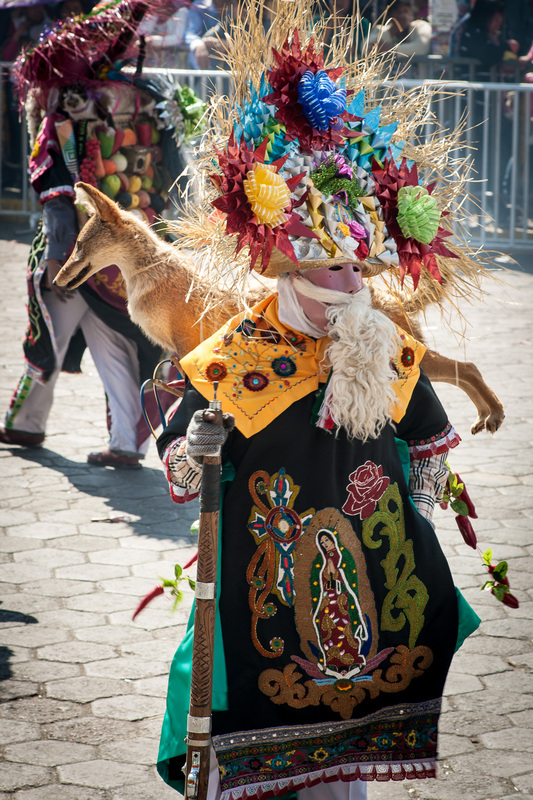 The Zacapoaxtlas stand out because they have the most elaborate and costly costumes. 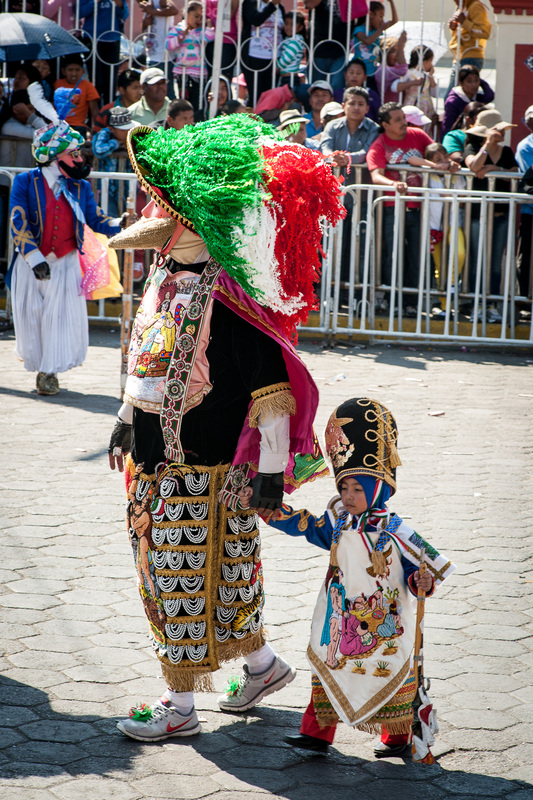 They dress as charros, with suits heavily decorated in sequins, a wig with the colors of the Mexican flag and a black cape. 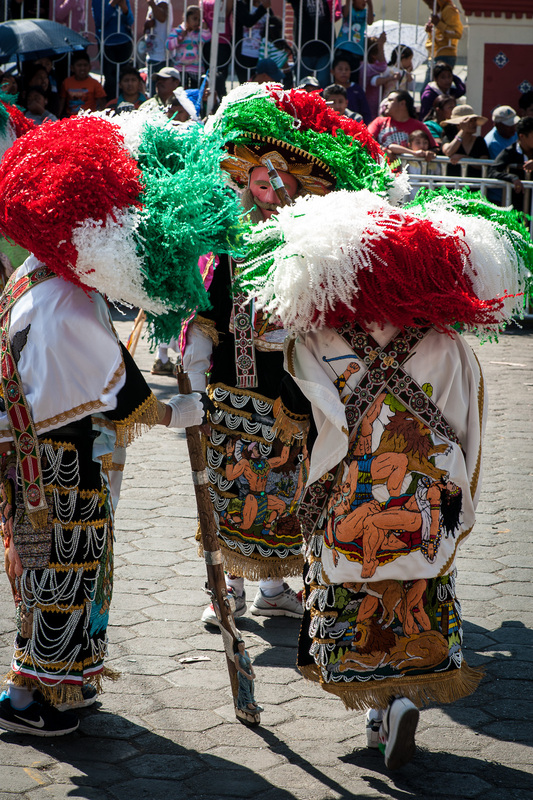 Representing the troops of General Zaragoza in the Battle of Puebla, they wear green, white and red paper streamers that hang off the back of their hats. Their suits are elaborated embroidered and sequined which has been hand done. These outfits have been valued at about 30,000 and sometimes as high as 50,000 pesos (Wikipedia). 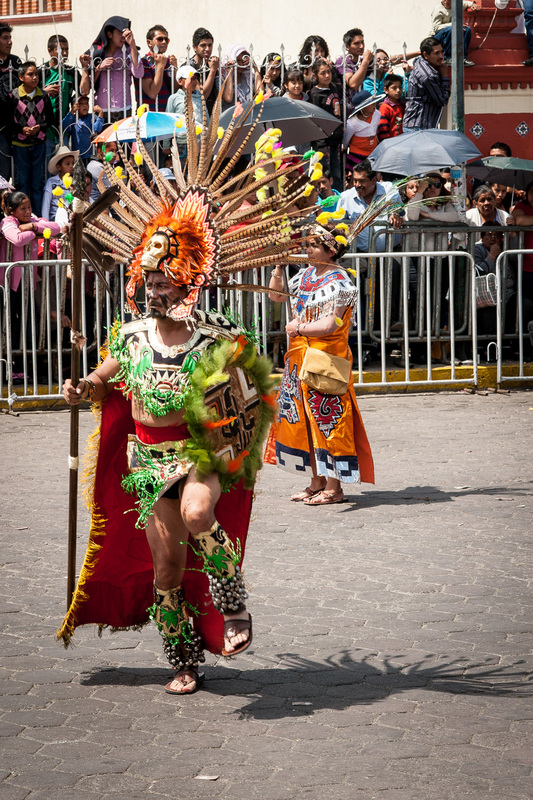 And, the "Apaches" wearing Aztec costumes fighting with the Mexican Army. The Apaches opened the parade. 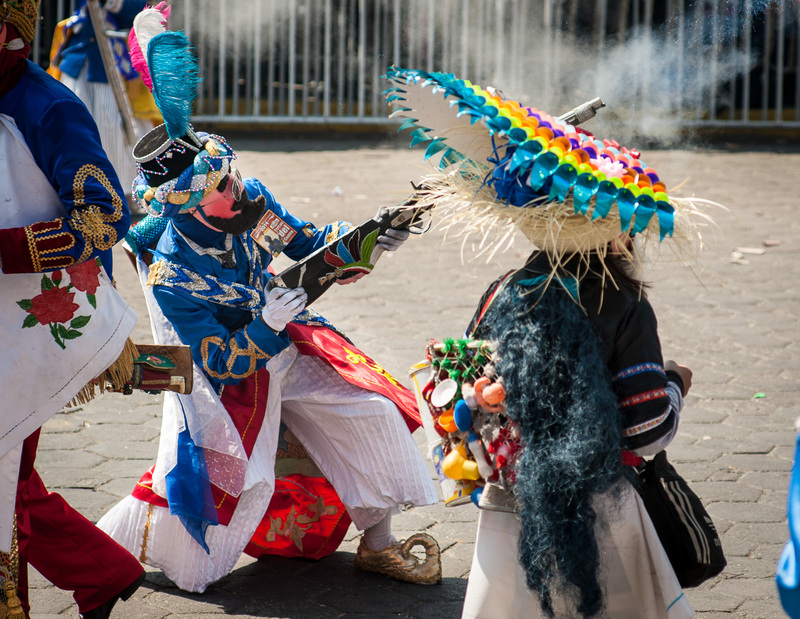 Most of the people representing sides of the Battle of Puebla are either carrying muskets, shooting them off, or reloading them for the next barrage. Periodically, parade security were forced to push these wild and crazy musket shooters along so the next battalion could parade past. The air was filled with the smell of gunpowder, and if a musket was fired in front of us, we could feel the impact of the shot. I finally figured out the body language to catch the firing of a musket. About five tons of gunpowder are used during the four-day period of firing thousands of muskets. But Dan got the best shot. He captured one of the guns going off in flames. No wonder there are so many injuries from gunpowder burns. With ears ringing after three hours of watching the parade (the participants parade past the viewing stands twice), we moved out of the stands to the central square to look for food. The food looked and smelled great. We settled too quickly on the barbecued lamb. There were so many other great choices. 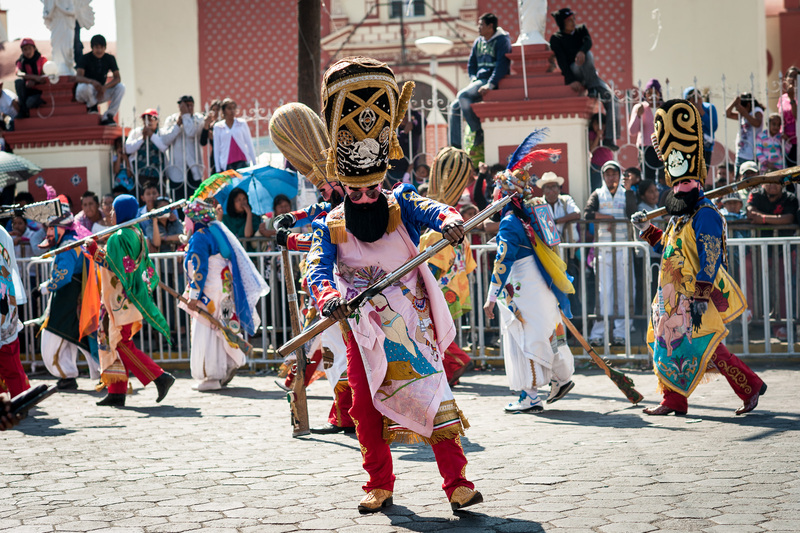 As we left Huejotzingo, muskets were still being fired across streets or at buses, and battalions were partying at nearby restaurants. On the bus back to Puebla, Dan realized that he should have used earplugs. I think he is a little deafer than before--or maybe that's just an excuse. Back to California tomorrow.